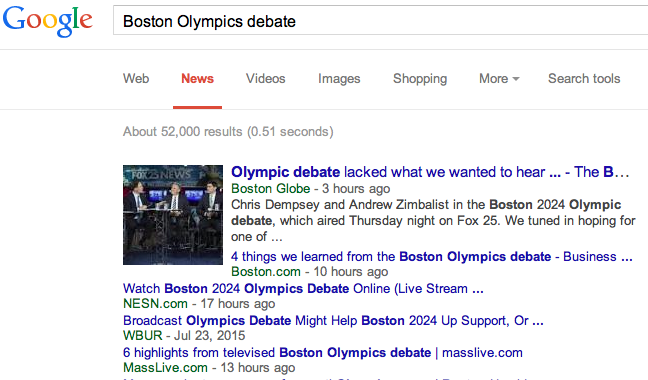 Last night’s less-than-Olympian debate on Boston 2024 gets lots of coverage in today’s news media. Co-sponsor Boston Globe, of course, has it top of Page One. Other local news outlets also provided debate coverage. But not the Boston Herald. The hissy local tabloid had only some limp piece about area mayors feeling left out of the process. Sort of like the Herald. Just a thought: Fox25 used to partner often for debates with the Herald. Not last night. The Herald used to partner with Suffolk to run [David] Paleologos polling. That’s gone. Why won’t anyone partner with the Herald anymore? Afraid of catching something? An Ad-itude Adjustment on 2024 Summer Olympics? As splendid reader Mike Barry so wisely predicted, it was only a matter of time until the machers at Store 2024 started paying to tell their side of the story. Especially after being poll-axed by WBUR last week, the Boston Olympniks needed some damage control in a hurry. On the coverage front, meanwhile, the local dailies are running true to form today: The Globe is the preferred conduit for Boston 2024 (see this Page One piece), and the Herald is the Marty Walsh Gazette (Mayor now game for Olympics vote). Sorta like we said the other day. In the wake of the new WBUR poll that registers a knee-buckling 52% opposition to Boston’s 2024 Summer Olympics bid, the major players have decided it’s time to buckle down. And to pick a local daily to get the word out. Not surprisingly, Mayor Marty Walsh has drifted toward the Boston Herald, while Boston 2024 gets a front-page boost from the Boston Globe. It was the ideal place to launch a grassroots movement: a Roxbury basketball tournament that drew a who’s who of political players, from the governor and mayor to city councilors and ward committee activists. And right inside the entrance were three young people handing out Boston 2024 wristbands and urging anyone within earshot to volunteer for the city’s Olympic bid. “Whether you’re for or against, we want to hear your voice,” Willie Bodrick II proclaimed as he pitched the Games to a local lawyer and nonprofit executive. Bodrick, a 27-year-old pastor who worked on Martha Coakley’s gubernatorial bid, is part of a sophisticated campaign-style operation that the local Olympic organizing group has built to persuade skeptical Bostonians to embrace efforts to land the 2024 Summer Games. And they all get trotted out here, from uber-consultants Doug Rubin and Will Keyser to “voter-mobilization guru” John Walsh to the ubiquitous Rev. Jeffrey Brown. Crosstown, the Boston Herald channels Marty Walsh in Richard Weir’s piece. 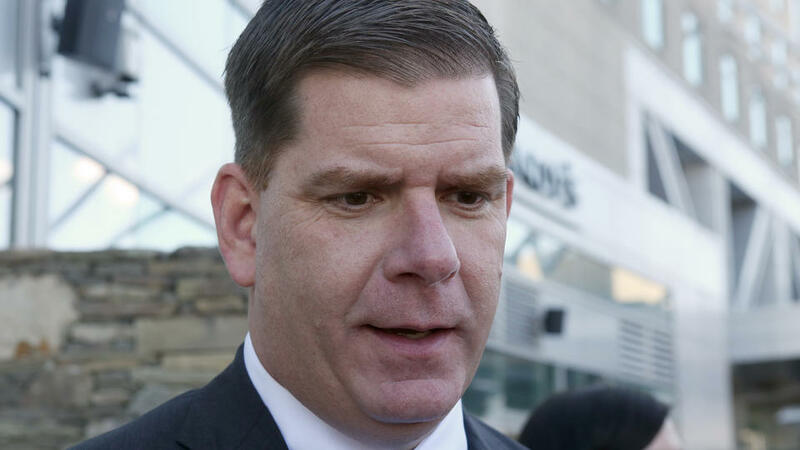 Mayor Martin J. Walsh, amid nosediving public support for Boston’s Olympics bid, is looking to hit the “reset button” in hopes of restoring confidence in the push to host the 2024 Summer Games and cutting his own political losses, according to City Hall insiders and observers. Walsh called out former Gov. 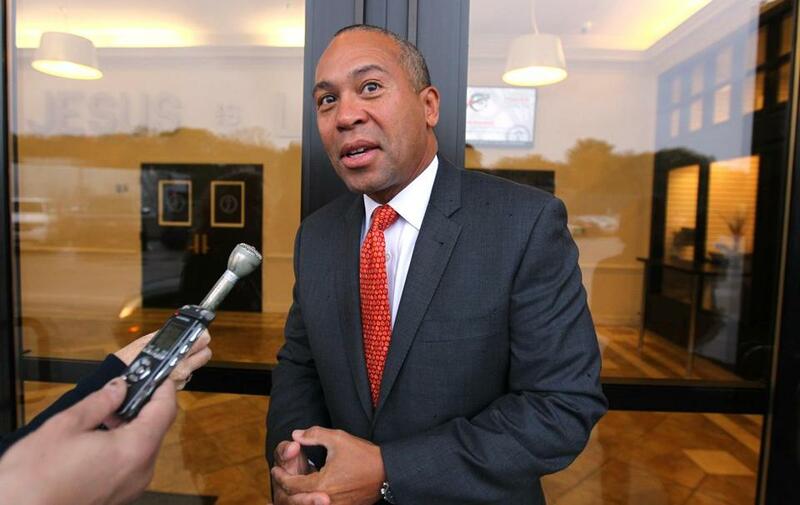 Deval Patrick Thursday over his controversial $7,500-a-day lobbying fee for the group behind the bid, Boston 2024, just hours before Patrick finally relented and said he would forgo pay for his work. “Mayor Walsh has hit the reset button on the Olympic effort given that this is his city and he has the most to lose politically,” said one insider close to the Walsh administration. Yeah – especially since he told WGBH’s Boston Public Radio last month that he’d consider 70% support for the Boston Olympics “satisfactory.” We’re a long way from that, Mistah Mayah, and headed in the wrong direction. This could get interesting if the Globe becomes the preferred conduit for the Boston 2024 machers, and the Herald generally serves as the unofficial newsletter of the Walsh administration. Nice his ‘n’ her columns in today’s local dailies about the latest hijinks from the high-rolling Boston 2024 machers. The Boston Olympic movement hit a new low this week, and even ringleader John Fish would have a hard time arguing with that. That would explain all the mea culpas. “There were some mistakes in communication,” acknowledged Fish, the chief executive of Suffolk Construction, in a lengthy phone interview. The mistake, of course, was not communicating, but why get technical about it. Crosstown at the Boston Herald, Howie Carrtoon’s column gives the Boston 2024 boyos a much harder time. Will Boston 2024 set up a booth at Halitosis Hall on Sunday morning so that all the hacks can fill out their applications for gainful unemployment at the next Big Dig? The St. Patrick’s Day breakfast — what better place to recruit yet more indolent dolts and layabouts who need no-heavy-lifting jobs (as opposed to work)? Come Sunday, John Fish, the unelected pooh-bah of this fiasco, can personally greet the payroll charlies as they stumble into the BCEC. If you “work” at the MBTA, boys, no need to fill out any of these intrusive forms. Your bona fides are in order. Have you lads been to visit your Uncle Whitey lately? You can probably fill in the rest of the hacky local tabloid rant. Of course if you want some facts about the Boston 2024 payroll patriots, you’ll have to look elsewhere. 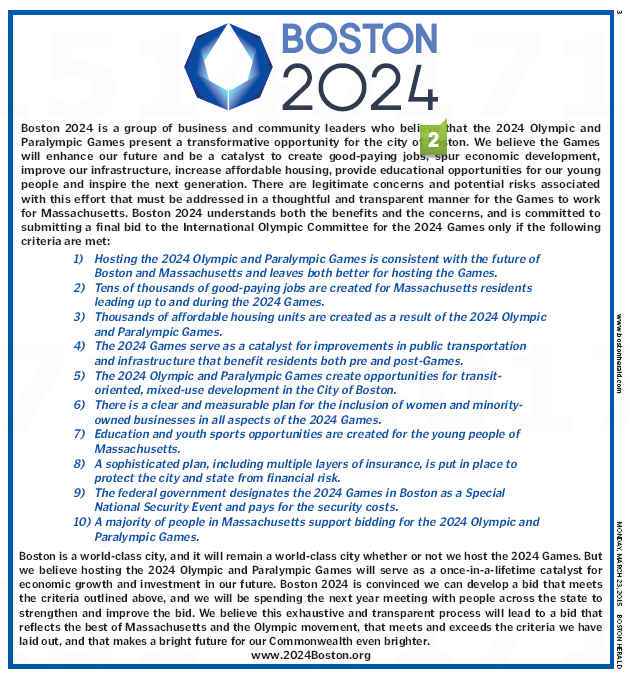 The hardreading staff recommends Adam Vaccaro’s piece at Boston.com that compares local Olympic spending to previous bids by Chicago and New York. The numbers are very instructive. Not to get technical about it. 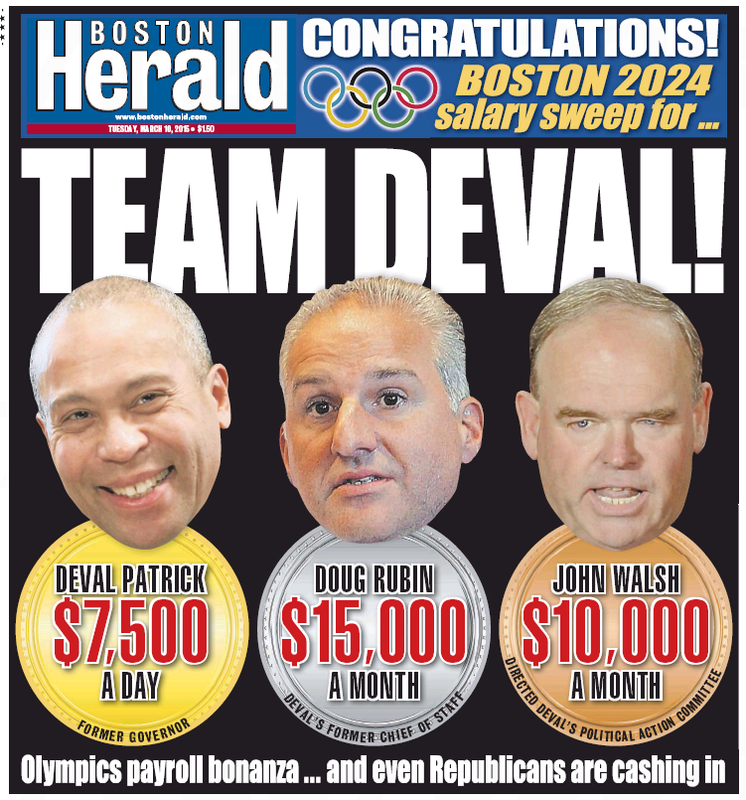 The local dailies are currently on Boston 2024, the high-rolling Olympic wannabe outfit, like Brown on Williamson – especially in the matter of who’s getting paid what. Today Boston hits the Dailies Double, with both papers front-paging the buckraking at the Olympic trough. Former governor Deval Patrick will earn $7,500 a day for occasional travel as a global ambassador for Boston’s Olympic bid, selling the city and its vision for the Games to the International Olympic Committee, according to salary data released Monday by local Olympic planners, who say they do not know how often Patrick would be on the job. 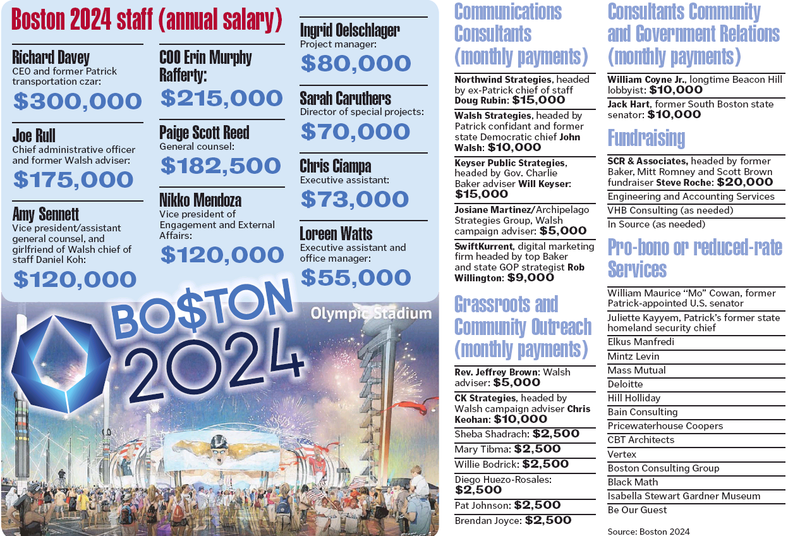 The local Olympic bid committee, Boston 2024, which is funded by private donations, is also paying $1,390,500 in annual staff salary, with six of 10 salaried employees making more than $100,000 a year. 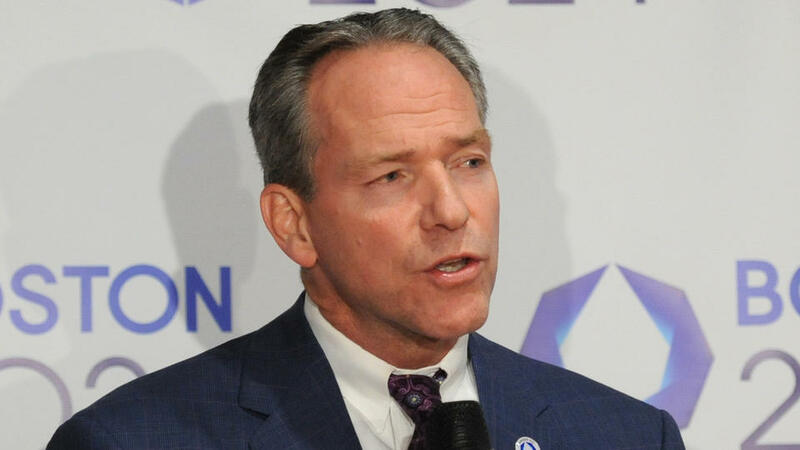 Chief executive Rich Davey topped the list at $300,000. That’s a lotta dough-re-mi, eh? Crosstown at the Boston Herald, it gets even worse. Do we see a pattern emerging here? 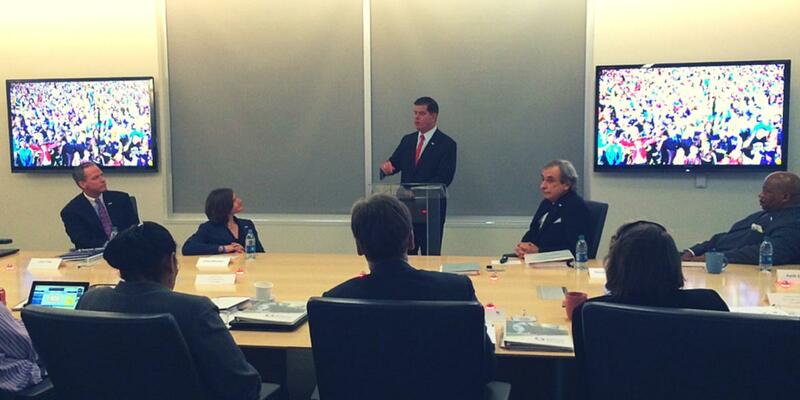 Boston 2024 operates clandestinely, local media force the issue on some issue, Boston 2024 forks over some information. Time to stock up on crowbars. 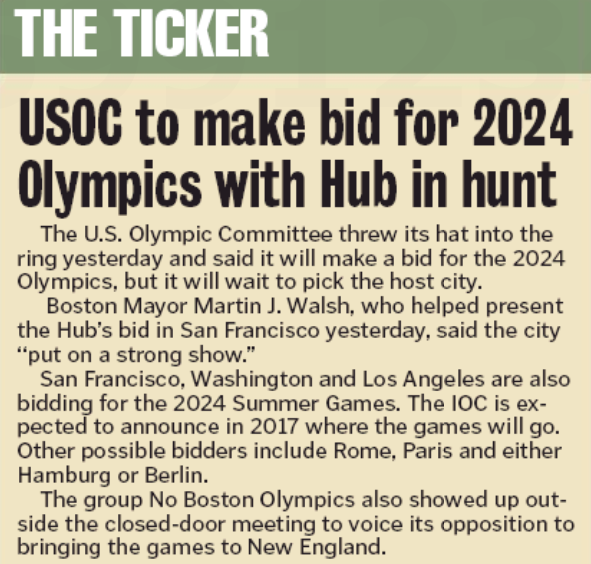 The Yes Boston Olympics group (not its real name) made its 2024 Summer Games pitch to the US Olympic Committee yesterday and got very different receptions in the local dailies. 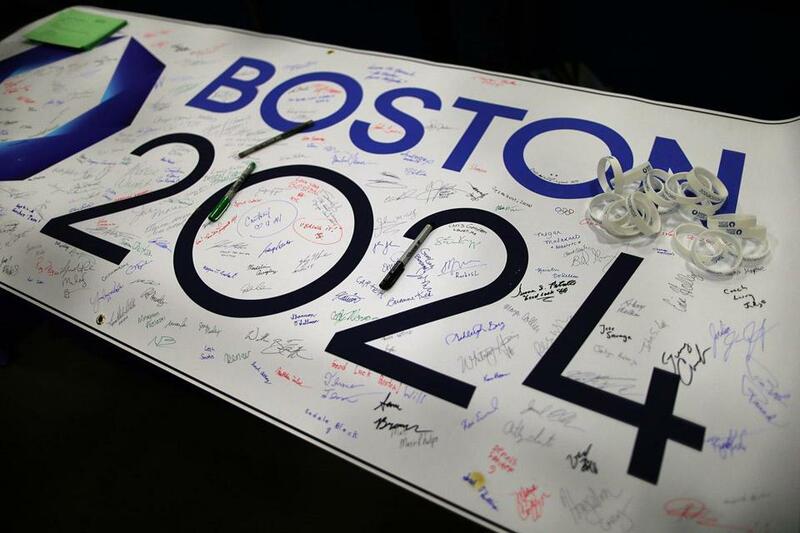 The US Olympic Committee’s board of directors voted unanimously Tuesday to submit a bid for the 2024 Summer Games and next month will choose one candidate from among Boston, Los Angeles, San Francisco, and Washington, D.C., to join what is expected to be a crowded international field. Or its business community anyway. Crosstown at the Boston Herald, the bid got significantly less play. Like page 21 play. Can we made Dirt Digging an official Olympic event? That’ll jumpstart the fizzy local tabloid, eh?